I recorded this northern mockingbird practicing its repertoire at the Brooklyn Botanic Garden. 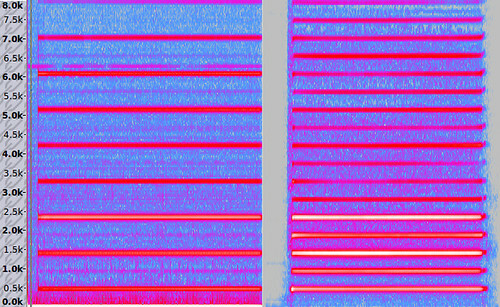 Below is a spectrogram of the recording. Here is a quick clip of me doing some throat singing. I sing an "oo" vowel at about 165 Hz (E below middle C), visible as the red bar along the bottom, then transition to a shape that emphasizes the eighth overtone of that fundamental, 8*165 Hz = 1320 Hz. So that's three octaves (2^3 = 8) higher, the E two above middle C, just out of my falsetto singing range. I then go up the harmonics, which you can see as steps of 165 Hz in the spectrogram, up to 1980 Hz (a high B), far outside my singing range.